Kuku is a Persian egg-based dish that is traditional New Year's fare, according to Wikipedia. It's another Vegetarian Times recipe which means it is light on the spices, but in this case it works. 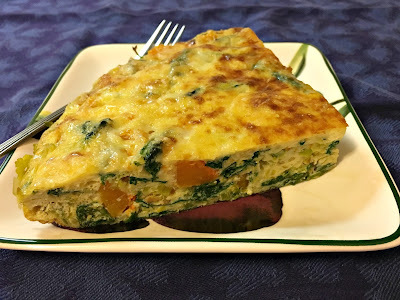 It is basically a frittata and the main reason I used the recipe was to try a different flavor combination and a new technique. Both were successful, with one exception. In the recipe as written you add the cheese after the bottom has barely set and then you put it in the oven to cook. I usually let it set on the stove top and then add the cheese and finish it under the broiler. Now the original recipe called for feta, which is not a melting cheese, but I am not a fan of feta so I used cheddar, which is a melting cheese so I am willing to concede that might be a significant difference. But when the eggs had set and I pulled it out of the oven there was no browning on top and I like for the cheeses to get a little browned. So I put it under the broiler for a couple of minutes and that did brown the cheese, but most of it had cooked into the kuku so it was less defined than I am used to and I missed that slightly crisp layer of cheese on the top. But cooking it in the oven made it rise more than the stove-top version and I did like that. It was softer and less dense and the flavors seemed to blend together more. So the next time I made it I put it in the oven without the cheese, cooked it a few minutes less, then added the cheese and put it under the broiler and that made it perfect for me and from now on I plan to make all of my frittatas this way. The other thing I really like about this version is the lemon zest. It is not so pronounced that when you taste it you can tell it is there, but it adds an overall brightness to the overall flavor, like adding lemon to any dish would do. When I was looking it up online, I found some recipes that added a lot of herbs. The next time I made it I had some parsley, cilantro and dill that I needed to use up so I added those. It was delicious as well. Like the frittata, the variations on this dish are endless. I'm not sure you can still call the end result a kuku, but it will be mighty tasty. Heat a tablespoon of the oil over medium-high heat. Add the squash. Cook 4 to 6 minutes, until the squash starts to soften, stirring occasionally. Reduce the heat to medium and add the leek. Cook another 4 to 6 minutes, stirring frequently, until the leek has softened and become translucent, adding more oil if necessary. Add the greens, in batches if necessary, and cook for about 5 minutes, stirring frequently, until the leaves are wilted. Crack the eggs into a large bowl and add the lemon zest and salt to taste. Whisk together. Add a small amount of the squash and greens mixture to the eggs to temper them and mix well. Add the rest of the greens. Return the empty skillet to the burner and heat a tablespoon more of the oil. Gently pour the egg and greens mixture into the skillet. Reduce the heat to low and cook until the eggs are slightly set on the bottom. Sprinkle the cheese over the top, then transfer the skillet to the oven. Bake for 8 to 10 minutes, until the top is set, then place under the broiler for a minute or two to let the cheese brown. Slide the kuku onto a large plate and let cool about 10 minutes, then cut and serve.